The Sisters of St. Joseph of Carondelet is a congregation of women religious which traces its origins to, and follows the spirit of, the foundation made in LePuy-en-Velay, France around 1650 by Jean Pierre Medaille, a Jesuit priest. Francoise Eyraud and her five women companions (Anna Brun, Marguerite Burdier, Claudia Chastel, Anna Chraleyer, and Anna Vey), under the pastoral care of Henri de Maupas, Bishop of LePuy, along with Fr. 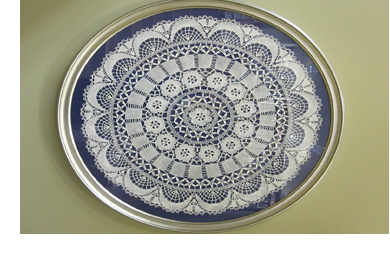 Madaille, were dedicated to “the practice of all the spiritual and corporal works of mercy of which woman is capable and which most benefited the dear neighbor (primitive documents).” The first Sisters taught young women lacemaking as a means of self-support. The community had a rapid growth until the time of the French Revolution when convents were suppressed and the Sisters were forced to return to their family home. Mother St. John Fontbonne was one of these Sisters. Many Sisters were imprisoned and some guillotined, Mother St. John herself was arrested and placed in the prison at St. Didier. However, martyrdom was not to be hers – the eve of the day scheduled for her execution saw the fall of Robespierre – July 27, 1794 – which meant the end of the Reign of Terror. Released from prison, she and her companions returned to her parent’s home. In 1807 Cardinal Fesch, Bishop of Lyons, asked her to re-establish the Sisters of St. Joseph in his diocese. Through Mother St. John the Congregation maintained continuity with the community founded by Father Medaille. 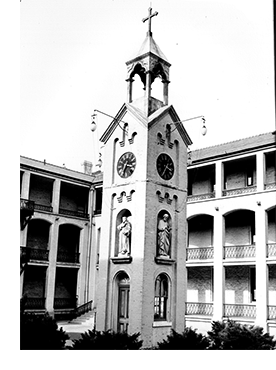 Motherhouse in Carondelet, MO – the bell for the tower was a gift from Mother St. John Fontbonne. 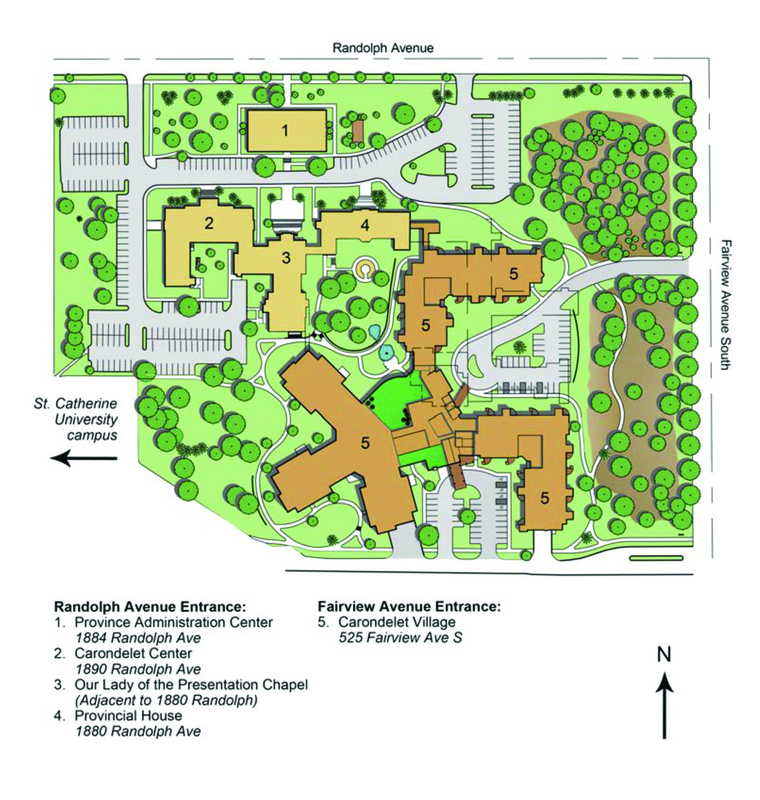 The Sisters of St. Joseph of Carondelet were established in 1836 when six Sisters of St. Joseph from Lyon, France, crossed the Atlantic Ocean to establish an American foundation in Carondelet, MO, near St. Louis. Sisters Febronie and Delphine Fontbonne, Sister Marguerite-Felicité Bouté, Sister Febronie Chapellon, Sister St. Protais Débouille, and Sister Philomene Vilaine were sent by Mother St. John Fontbonne in response to a call from Bishop Rosati, first Bishop of St. Louis, to provide instruction to children and to those who were deaf. 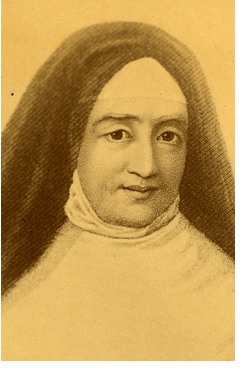 Their passage was financed by Felicité Duras, Countess de la Rochejacquelin, who had a great love and admiration for Mother St. John Fontbonne. Early version of St. Joseph’s Hospital, September 1854-1890. 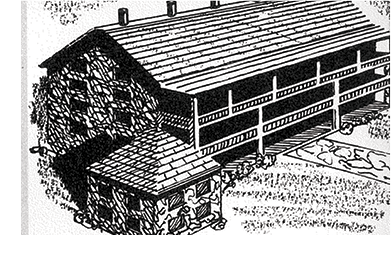 The first hospital services were dispensed from the Sister’s log cabin chapel during a cholera outbreak in early 1854. On November 3, 1851, four Sisters from St. Louis: Mother St. John Fournier, Sister Philomene Vilaine (both from the original Lyons group), Sister Scholastica Vasques, and Sister Francis Joseph Ivory (both Sisters who entered the Congreation in Carondelet), arrived in St. Paul, MN. 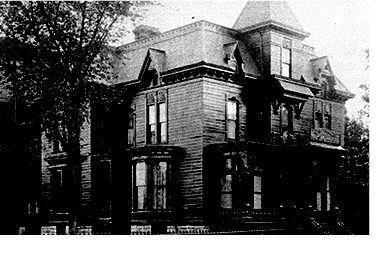 St. Agatha’s Conservatory began at the Lick House at 10th and Main, then moved to Judge Palmer’s Residence (photo) in 1886. It was rebuilt and is now the Exchange Building on Cedar and Exchange. The remarkable growth of the St. Paul Province began with the entrance of two of its early postulants, Ellen Ireland and her cousin Ellen Howard, in the summer of 1858. By then, the pattern of response to need had been firmly set with the opening of St. Joseph’s Academy in St. Paul, Long Prairie Indian Mission, St. Anthony’s School in Minneapolis, and St. Joseph’s Hospital and Cathedral School in St. Paul. Orphans were welcomed and taken care of in all these institutions. 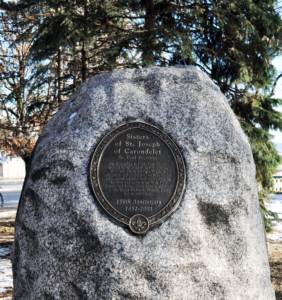 Those fortunate enough to participate in the 150th celebration of the establishment of the St. Paul Province in 2001 will recall the dramatic reenactment of the Sisters’ arrival at the lower landing along the Mississippi River on a wintry day, the hardships of their early years, and their remarkable story in the Upper Midwest as they served (and continue to serve) as educators, nurses, administrators, artists, musicians and poets, cooks and gardeners, spiritual directors and social activists—all against a background of contemplative prayer. 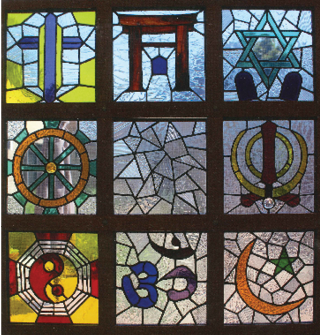 After Vatican Council II (1962-1965), the Sisters began to expand their ministries, focusing on the services of peace, justice, and advocacy for marginalized groups. These ministries include services for immigrants, health care for the uninsured, and safe places for the disenfranchised people of the Midwest. Sarah’s… an Oasis for Women welcomes women from all over the world who have survived violence, abuse, torture, war, discrimination and trauma. At Sarah’s, they can accomplish their goals and revive their spirits. 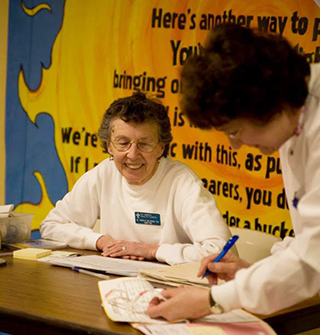 St. Mary’s Health Clinics provides necessary and accessible health services to the medically uninsured and underserved. 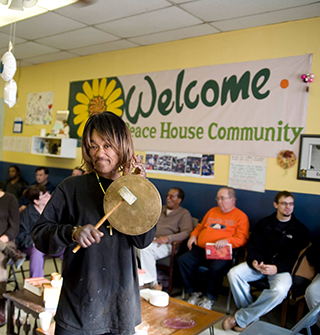 Peace House Community offers a non-violent, welcoming and inclusive community for poor and marginalized women and men who are seeking companionship, safety from the streets and personal affirmation. The St. Paul Province Sisters joined with other CSJ Provinces in expanding their ministries abroad, embarking on missions to Hawaii (1938), Japan (1956), and Peru (1962). Our archives document the history of these ministries, as well as the vast body of personal and professional work done by the Sisters. 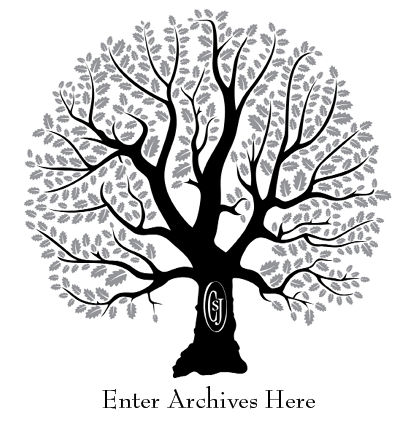 The mission of the Archives of the Sisters of St. Joseph of Carondelet, St. Paul Province is to preserve and share the history, spirit, and memory of the Province. The Archives are established to identify, collect, arrange, preserve, and make available to qualified researchers the official non-current administrative records and historical materials relating to the governance, ministries, and members of the Province.